The Veterinary Medicine & Animal Care Project in Argentina is very much a practical placement for people who love animals! Whether you are a pre-university student considering a career in veterinary medicine, an undergraduate, graduate, or simply a passionate animal lover, you can get involved in our Veterinary Medicine & Animal Care project in Argentina. 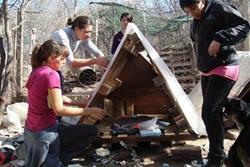 Veterinary Medicine & Animal Care volunteers work in Cordoba, the second largest city in Argentina. For two days a week you will work alongside a qualified vet in a clinic, helping with the day to day work there. For the other three days you will work at a dogs’ shelter. Unfortunately in Argentina, as in many other undeveloped countries, domestic animals are often not cared for properly and animal rights are not taken into consideration. 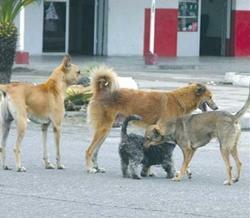 Many visitors to Argentina are surprised by the numbers of stray dogs and people using horses as transportation. It is sadly common for cats and dogs to be abandoned and they may suffer car accidents, starvation and numerous illnesses. At the clinic volunteers observe how the animals in the clinic are treated and often have the chance to assist the local vet during an operation, or when checking an animal. Volunteers also help liaise with the animal's owners. The amount of hands-on work allocated will depend on your individual level of knowledge and experience. 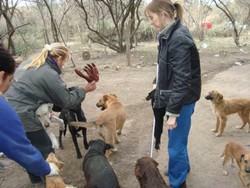 The dogs’ shelter is located in Villa Allende, 20km from Cordoba. The shelter accommodates more than 150 dogs. The dogs stay at the shelter until they can be re-homed. The shelter is run by the local town hall, however it receives little funding and the conditions are extremely basic. Volunteers help by feeding the dogs, washing them and walking them, so they are not left all day in their cage. Volunteers also help by writing blogs and recording the details of each dog, including the vaccines they need and their age. Help is also appreciated with finding homes for the dogs and maintenance work at the shelter. At the dogs shelter there is likely to be plenty of hands-on work for all volunteers, including putting to use what you have learnt at the clinic working with the vet. You will be able to help with vaccinations and delousing the dogs. Speaking at least some basic Spanish is recommended and the more you speak the more you will be able to get involved with liaising with the pet’s owners and tasks like finding foster families for the dogs. On your first day you will be introduced to the placement supervisors and the vet you will be working with. You will typically work for about four hours a day. You can join the Veterinary Medicine & Animal Care project in Argentina for two weeks if you don't have time to join us for a month or more. This project has been selected by our local colleagues as being suitable for short term volunteering for both the host community and the volunteer. Although you will gain a valuable cultural insight and work intensely within the local community please be aware that you may not be able to make the same impact as someone volunteering for a longer period.